It’s my distinct pleasure to release International Bird Rescue’s annual report, a comprehensive look at our 2013 calendar year achievements that span the IBR mission: oil spill response, wildlife rehabilitation, innovative research and outreach to the communities we serve. Download the 2013 Annual Report here (7.1 MB). We’re extremely proud to have improved IBR’s financial outlook in 2013. A surplus in operating revenue helped us to shore up a 2012 deficit, while our strategic moves to cut administrative expenses and expand oiled wildlife response work to Canada (where it’s greatly needed) gave us new opportunities to strengthen IBR’s financial future. But we’ve not stopped for a moment to rest. This year, we’ve seen an extremely busy season at both of our California wildlife centers, commanding additional staff and resources to carry out the Every Bird Matters pledge. In 2014, we’ve also undertaken required improvements to our Alaska operations with a new Alaska Wildlife Response Center in Anchorage. This is a significant investment, but one critical to oiled bird response in the pristine Alaskan environment that we serve. As the world goes to greater lengths for energy extraction, IBR’s work has never been more important. And your support of us has never been more needed. We thank all our members for ensuring that injured, oiled, abused and orphaned wild birds get the care they deserve from the world’s experts. P.S. – As of this week, our centers are caring for over 300 birds, many of which are orphans. These are extremely busy days for our staff, who raise ducklings, goslings, killdeer, avocets and more. 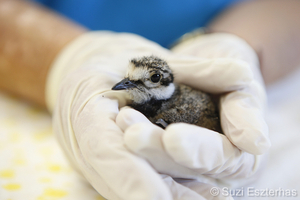 You can support their care through our Orphaned Baby Bird Fund! This entry was posted on Thursday, May 29th, 2014 at 7:15 am and is filed under Features, News. You can follow any responses to this entry through the RSS 2.0 feed. You can skip to the end and leave a response. Pinging is currently not allowed.